This birthday card was created with a teenage girl in mind. 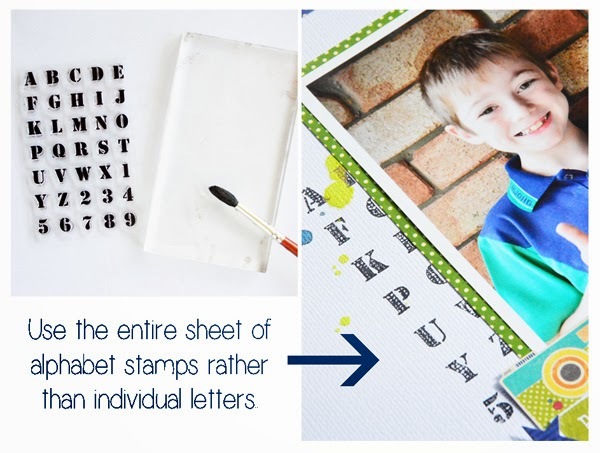 For a quick and easy embellishment, stamp the ticket images onto smooth cardstock and distress with ink. Add your sentiment directly to the ticket and then fussy cut it out. other: Lilybee Designs alphas, white cardstock, foam tape. Create this fun wall hanging great for DIY kid's rooms. 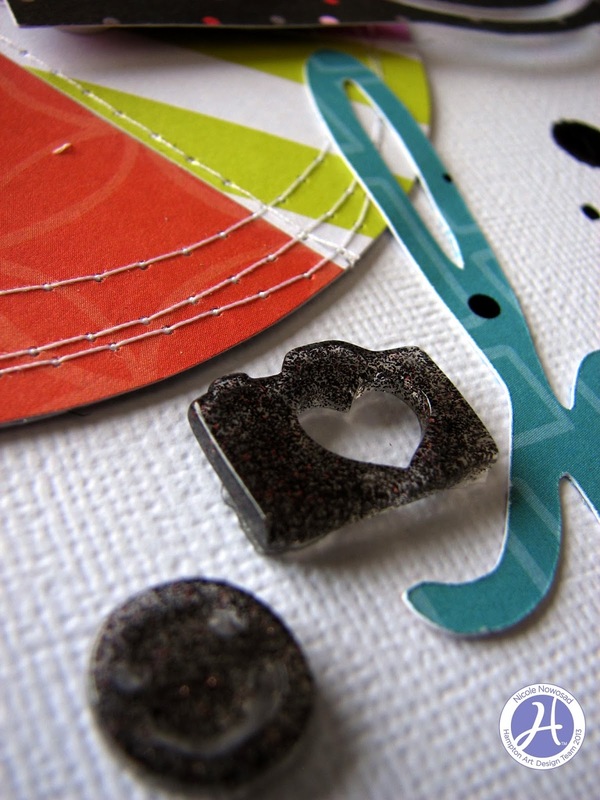 Try stamping on a variety of surfaces to add interest to your mixed media. 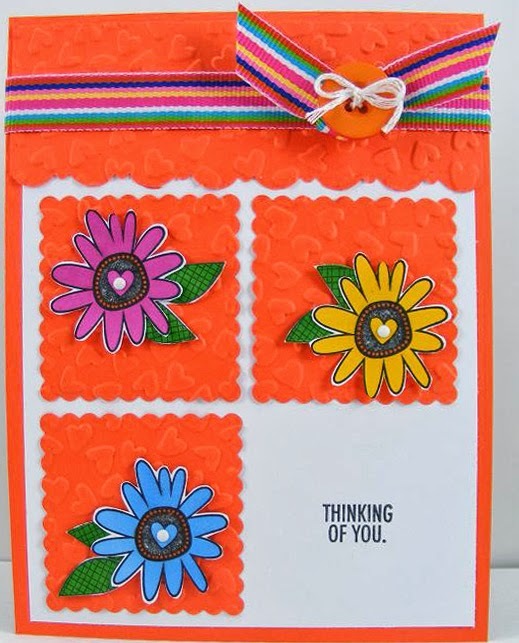 So excited to share with you today a card made from the brand new Jillibean Soup Spicy Social collection stamps, papers and embellishments. I am in love with this fun social media collection, especially since it can be used for all age groups. So this card began with a green card base, my favorite color. Then I added the center panel of “3 Parts Friends” paper then a mat was cut for the bite size bit using the other side of “3 Parts Friends paper”. 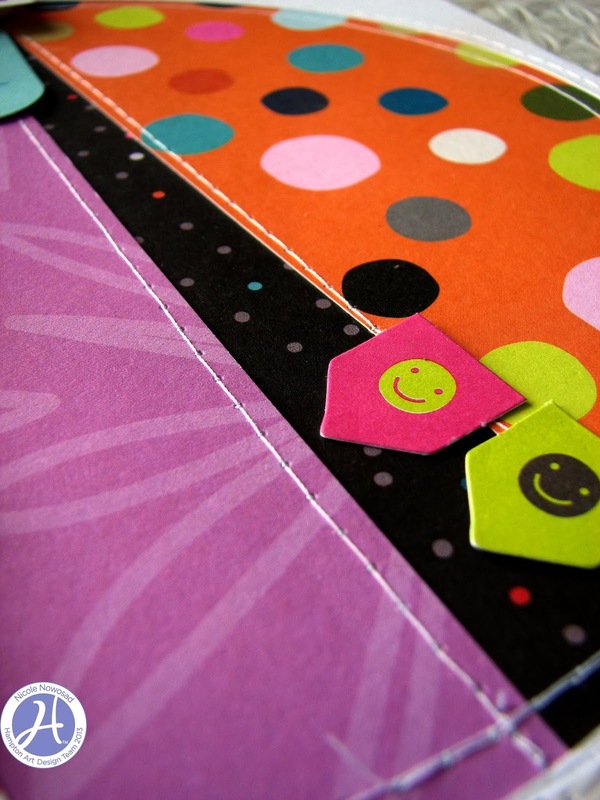 Attach the bite size bit to that mat and then adhere to the card base with 3D foam dots. 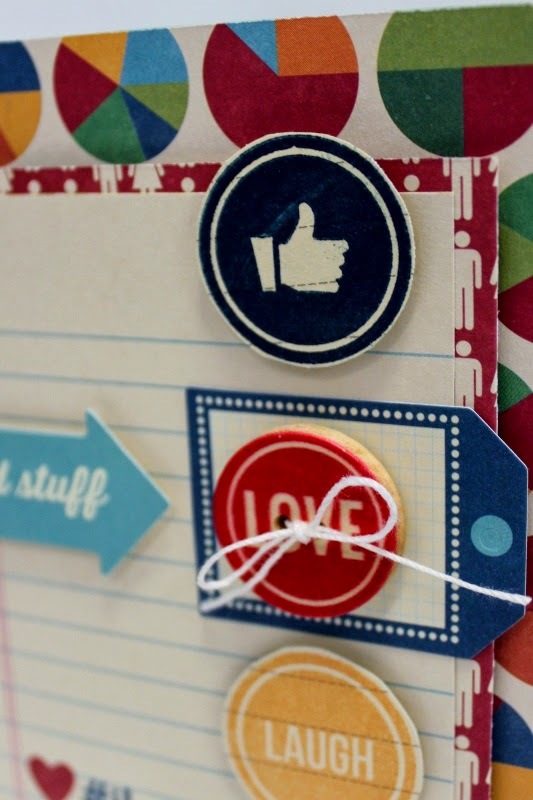 Next I stamped the “like” symbol and the “laugh” icon onto notebook patterned paper in navy ink and yellow ink. After they dried I cut them out and attached them to the card with 3D foam dots as shown. Using the Spicy Social Sticker Sheet I chose the blue tag sticker and placed in center of stamped circles as you see in photo. Next I added one of my favorite new embellishments on top of the tag: a wooden nickel button after I ran white string through it and tied it into a bow. The last touch was the good stuff arrow sticker from the same sticker sheet attached with 3D foam dots. Like, Love and Laugh is a nice message to send to a special friend or family member, so get on it and create your own today! I have a drawer full of bright and funky cards all covered in glitz and glam! However, every now and again I find the need for a card that has a simple message conveyed in an understated way. And believe me, I don't mind putting the glitter away! 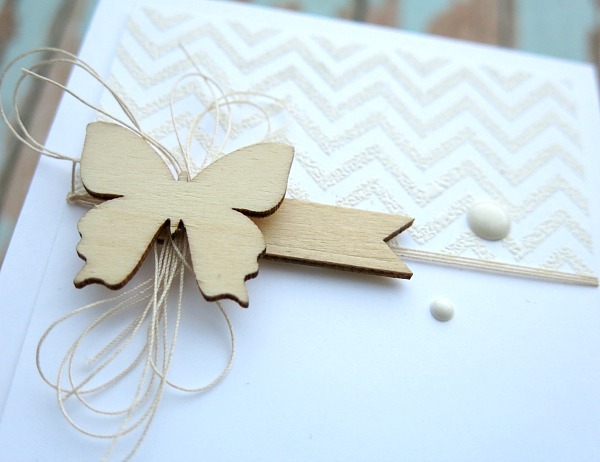 I tried to keep the card very subtle by using white on white with only a hint of colour in the wood pieces. 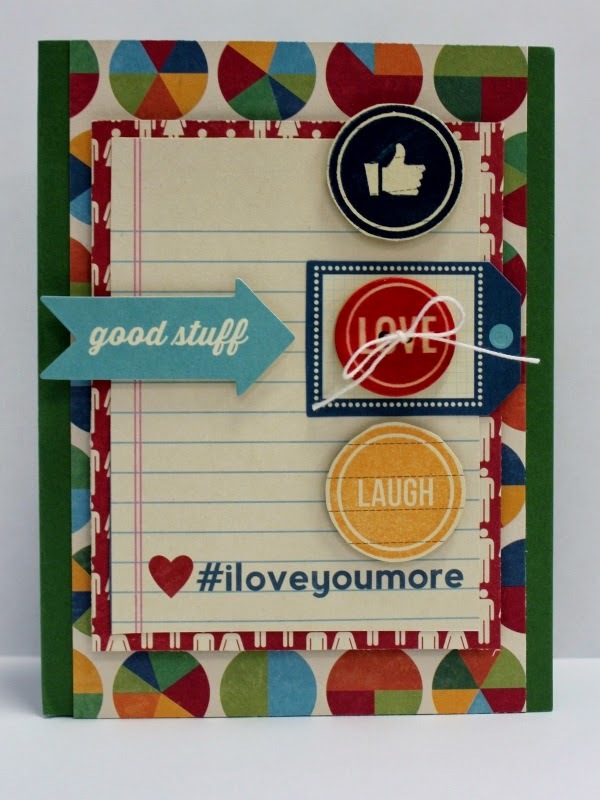 The chevron background and sentiment are both stamped and embossed in white. So happy to be joining you on the Hampton Art blog today! Here's a card I whipped up with some Jillibean Soup goodies. 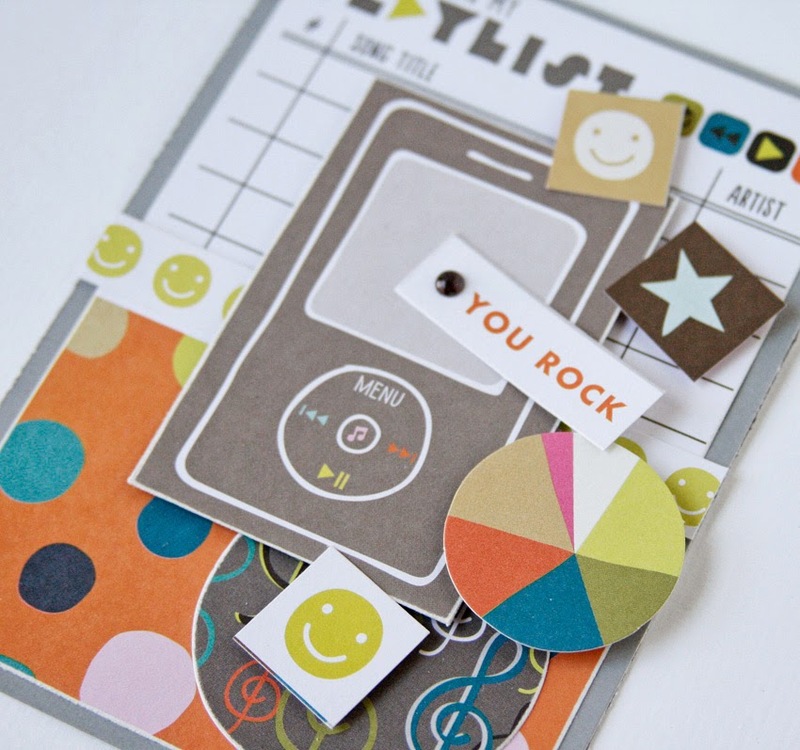 So simple to do with the new Mini Placemats Die-Cut Cardstock! I like to line the inside of the card, especially when I use a dark card base. 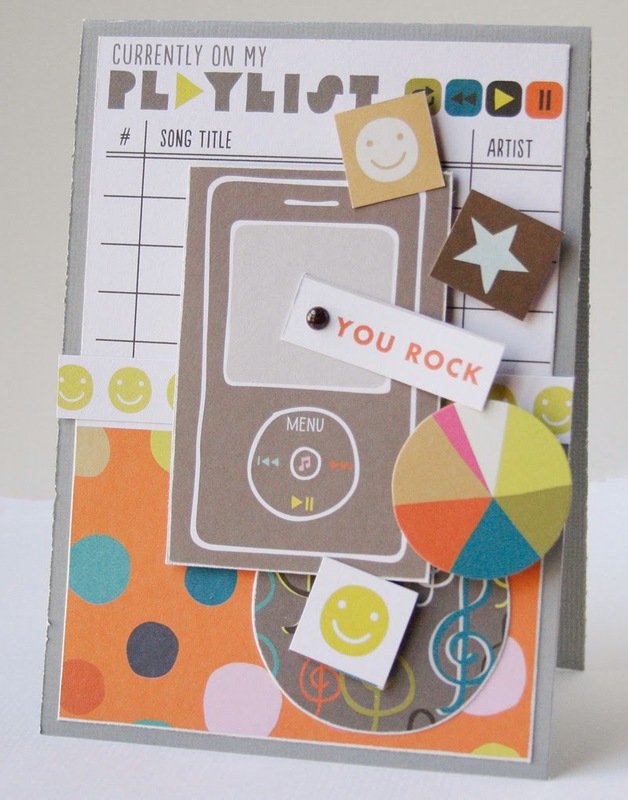 It is fun to bring a touch of the card front to the inside of the card, too! 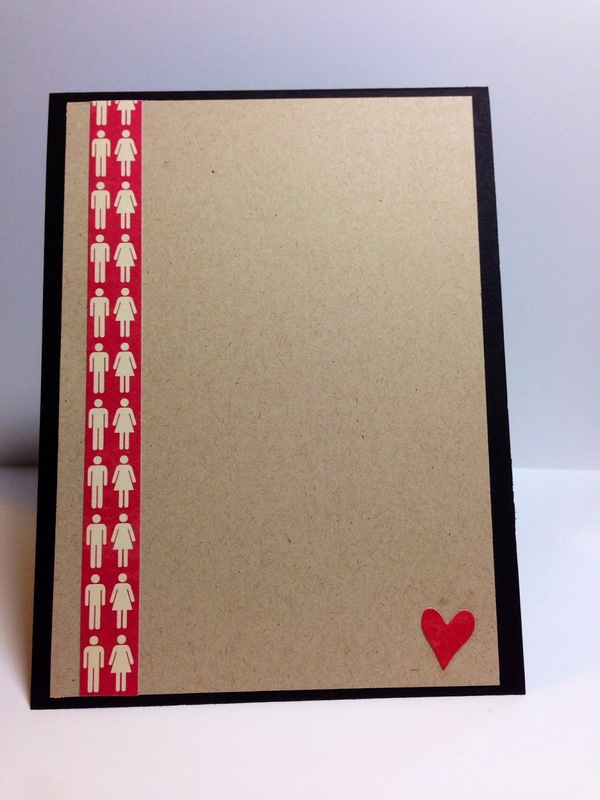 Just a touch of the same patterned paper or a repeated icon like the heart will do the trick. 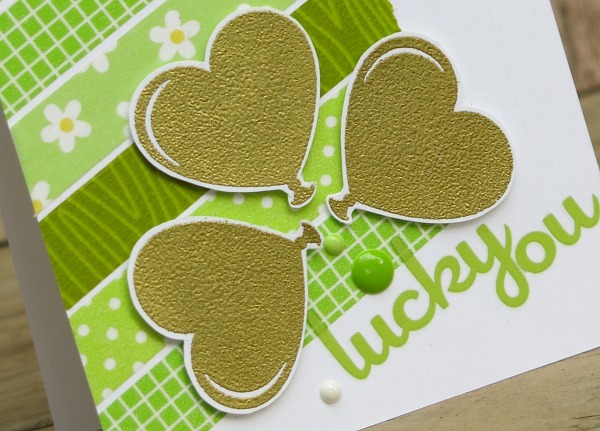 Today we have another video for you by our designer, Dana Warren, featuring how she created this classy thank you card. 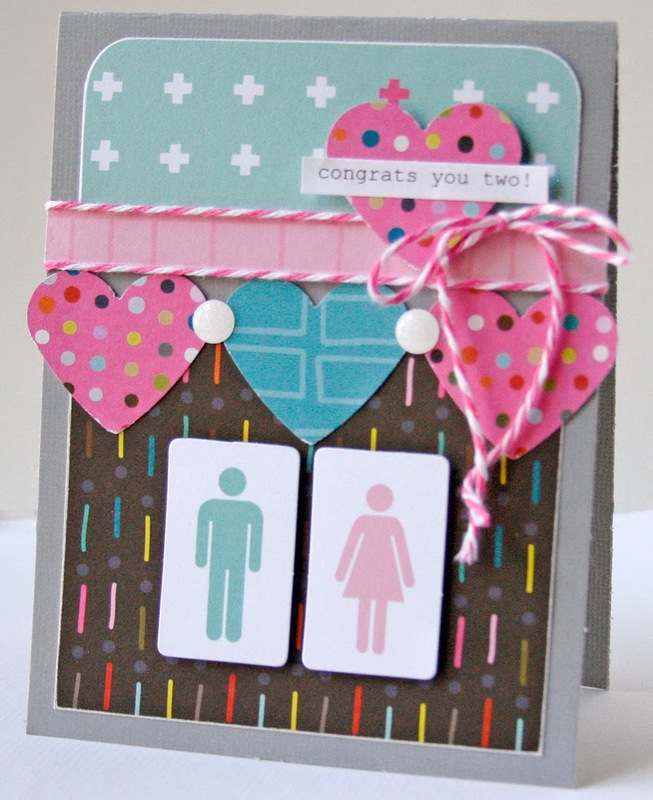 Three cards created by designer, Beverly Sizemore using the same stamp set! 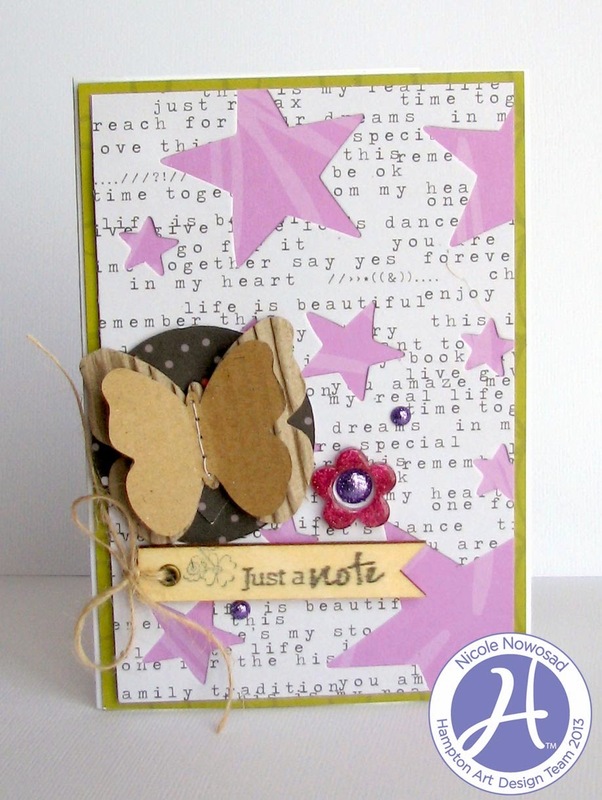 Two cards by designer Leanne Allinson featuring Hampton Art stamps! 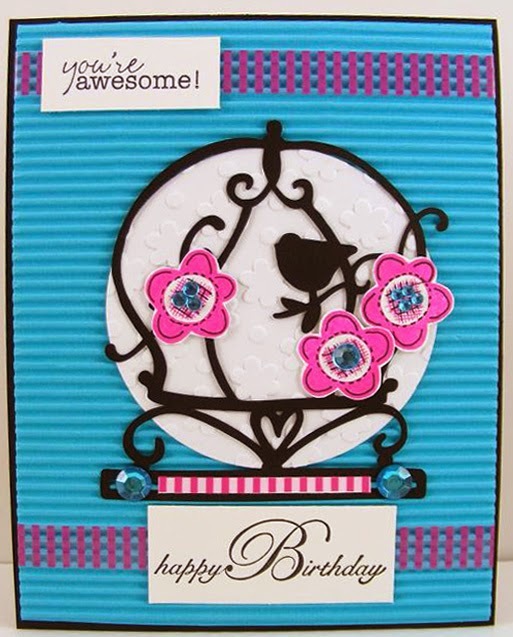 I created a bright and happy card for a young girl by choosing pretty colors of pink and blue. I added two colors of ink to the Echo Park | Bundle of Joy image with colobox inks. 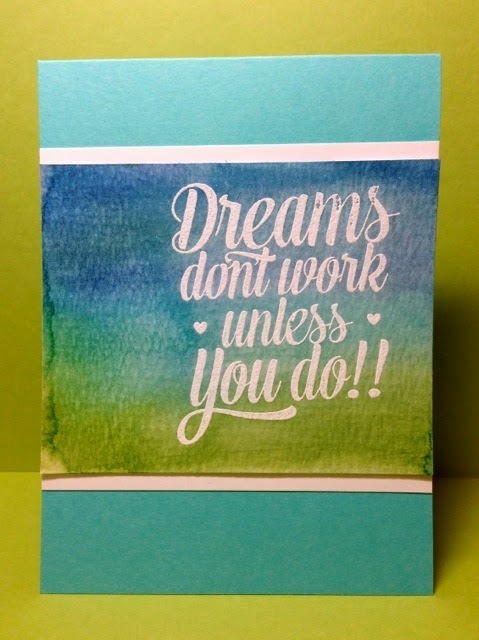 I then mounted the sentiment on foam tape and added it to the layers of my card. other: cardstock, toothpicks, ric rac ribbon, pearls, Bella Blvd crochet heart. Designer notes: Stamp your Bella Blvd | Sand N Surf flower images directly onto vellum. 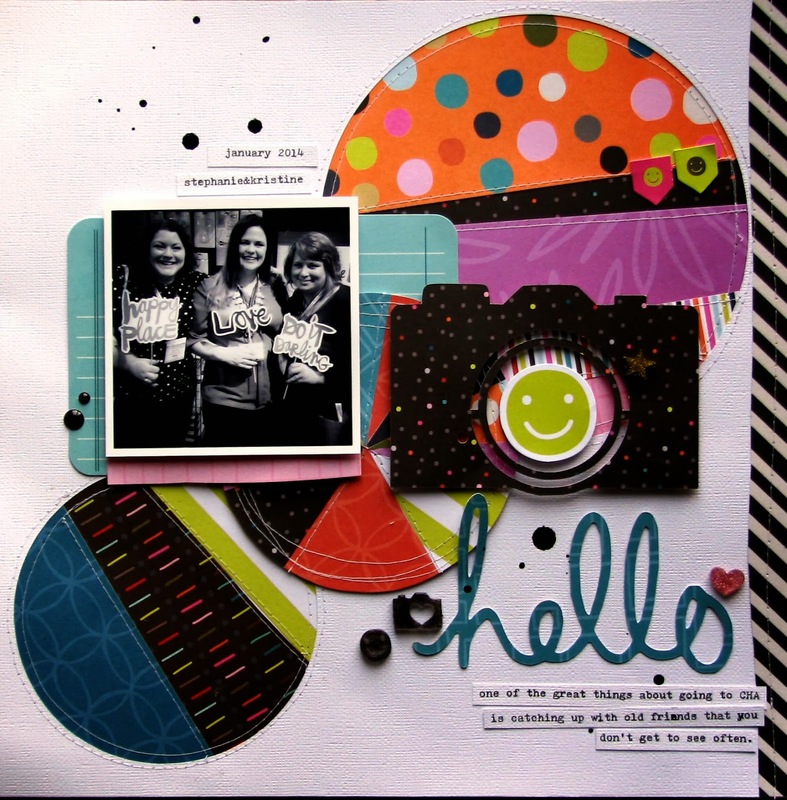 Allow some time for the images to dry completely, then fussy cut and offset them to similar sized punched circles. By doing this the card looks as though it has a bokeh effect. other: vellum, cardstock, silhouette cut file. So happy to be joining you on the Hampton Art blog today. I made two cards with the Jillibean Soup / Hampton Art Tiny Stories clear stamp set. 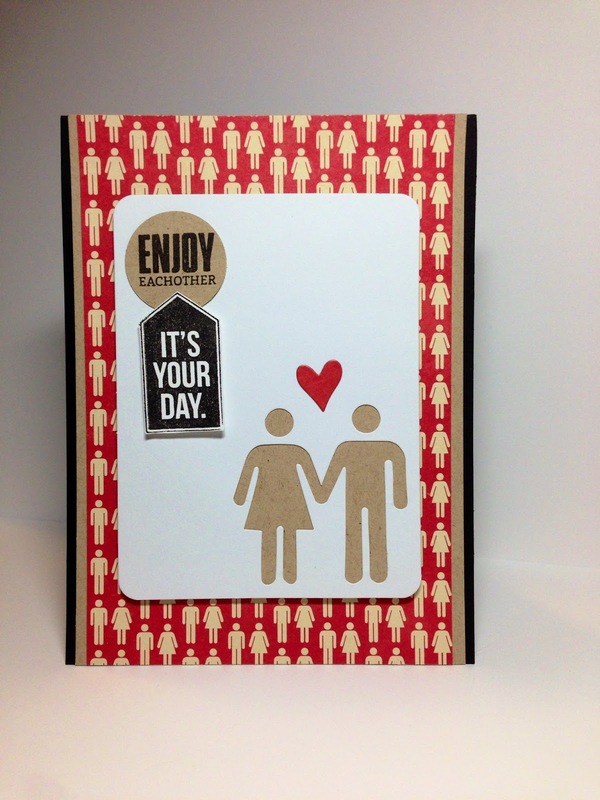 I really like the fun sentiments in this set and that they are large enough to be the focal point of a card. Today I paired them with the trendy watercolor technique. 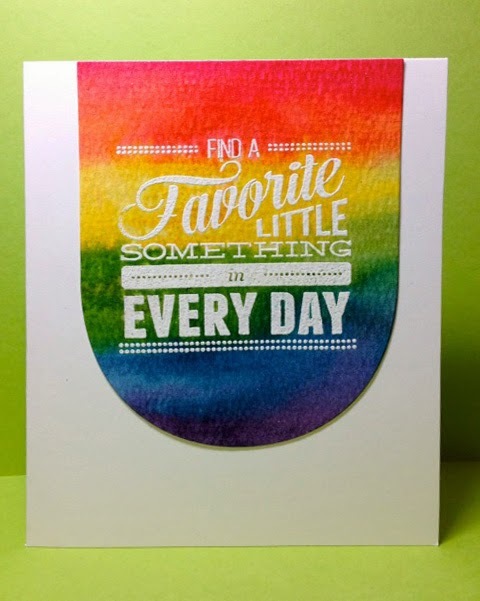 1) Stamp the sentiment on watercolor paper with clear ink. 2) Sprinkle with embossing powder. 3) Heat with a heat gun and let set a few minutes to cool. 4) Scribble the paper with your favorite distress markers. 5) Spritz the paper heavily with water and let it dry. 6) Clean the sentiment quickly with a baby wipe to remove some of the marker. Happy St Patrick's Day to everyone! Today I would like to share a fun card I created for the March 17 celebrations. Instead of having the traditional pot of gold at the end of the rainbow I decided to use a gold three leaf clover instead. Each leaf was stamped using the balloon heart stamp from the Jillibean Soup 'heart healthy red bean soup stamp set and then embossed in gold. I love when a project comes together very quickly. 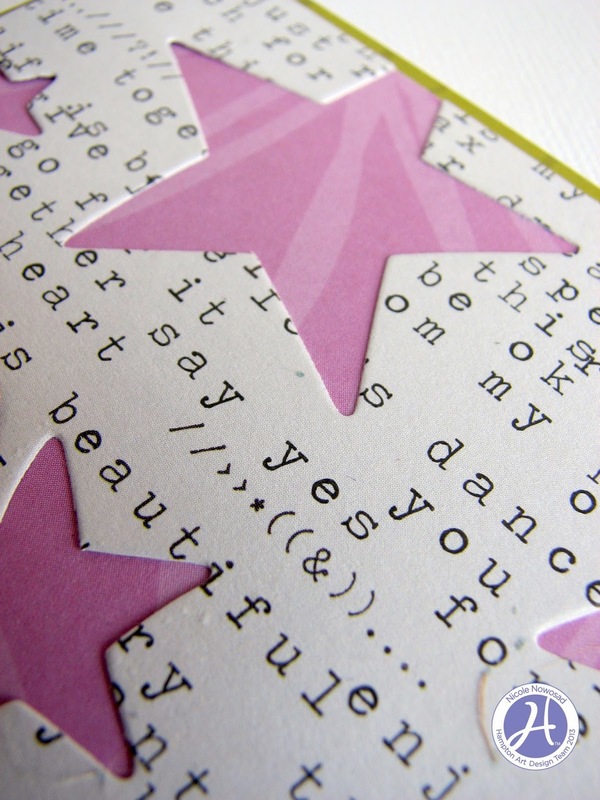 Once I cut my card base from green patterned paper, I simply layered on a scrap of the star die cut background paper with a pretty light purple paper from the KI Memories Playlist collection behind it. Next, I added a punched circle, with 2 corrugated Jillibean Soup butterflies that I stitched together. 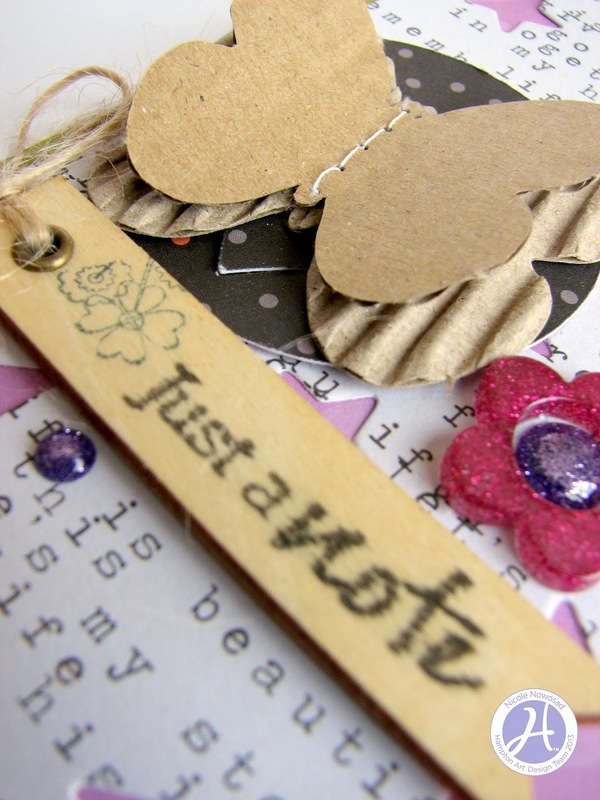 Stamp a sentiment onto a wood flag Stampables shape from Jillibean Soup, tie with some twine and finish your card with a few KI Memories Glitter Dots and Acrylic Shapes! We were blessed this year to celebrate our son’s fifth Birthday at a local Science Museum. We had tons of fun including the Curious George exhibit, Outer Space Explorations, a walk down Progress Lane and finally a 3D Penguin Movie. 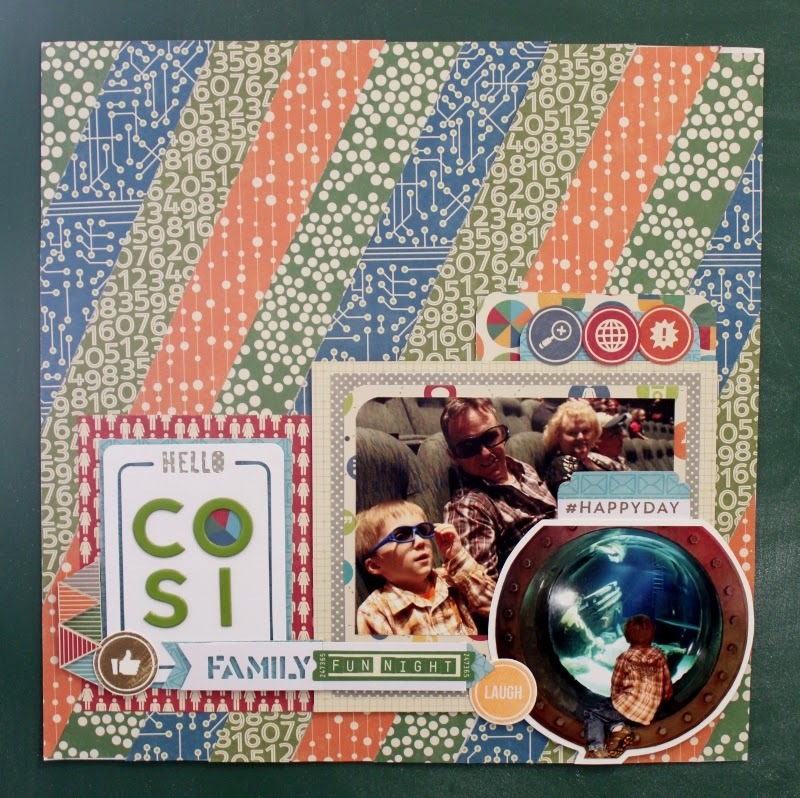 I wanted a special layout to capture the moment and the Jillibean Soup Spicy Social papers, embellishments and stamps were the perfect selection. The designs in the collection coordinated so well with the science theme, colors and the photos. To create the background I used a ruler as a template and laid it diagonally across each pattern paper 3 times to make the strips. Then I cut the strips out and laid them out in a pattern attaching them diagonally onto a 12 x 12 scrap page. Next I made the five mats for the the photo and mini placemat with coordinating papers as shown. 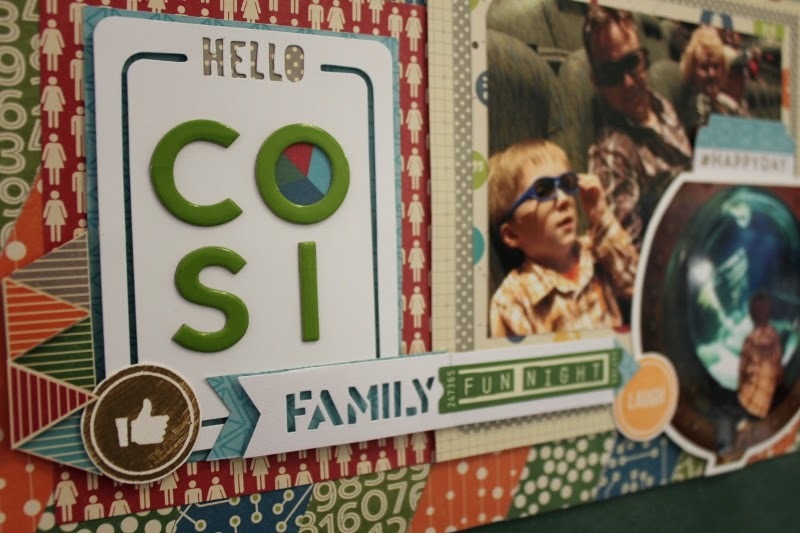 The “Hello” mini placemat was added with 3D then embellished with the new Beanboard alpha in Gumbo Green to spell out the museum name, C.O.S.I. With a pie chart added in the “O” just for fun. Then the photos were added with white cardstock matting the circle photo to help it pop a little more. Another placemat was utilized and trimmed down to create the “Family” banner piece, next to it is the ticket soup label with the new mini alphas used to spell out “Fun Night”. The tab over the main photo was made from two different coordinating papers with three appropriate circle icons from “1 Part App” paper. The tab over the circle photo was cut from “Taste of Texts” paper at bottom utilizing the white strip to stamp “#happyday”. 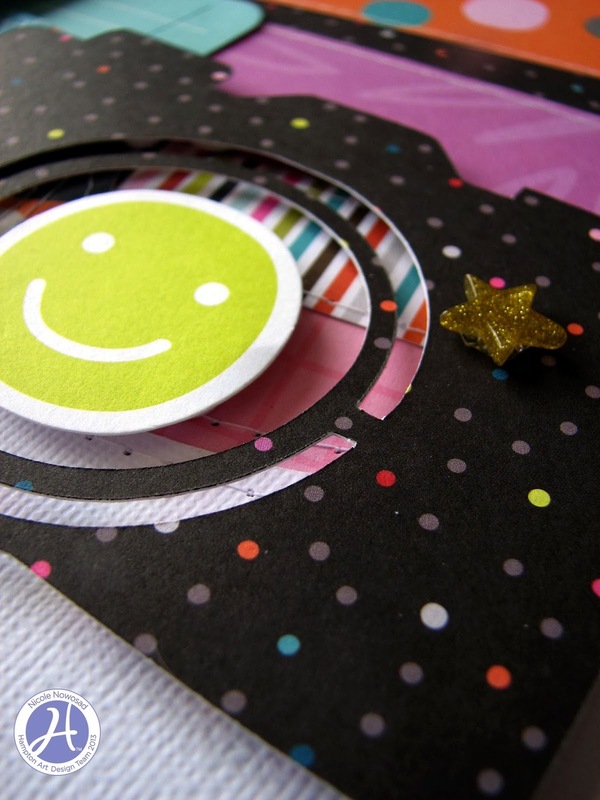 The “like” symbol and “laugh” symbol were then stamped onto white cardstock using brown and yellow ink and added to layout with adhesive. Finally a fun triangle tab was added to the left side of layout with two triangle cut out and popped up on top with 3D dots. Hello Family Fun Night, right? I really loved how this one turned out, this collection is so much fun to play with. It may be perfect for your next family layouts too. Need a baby shower card and gift bag anytime soon? Here is a cute set made from a Hampton Art/Bella Blvd. stamp set and Bella Blvd. papers for one precious baby girl. 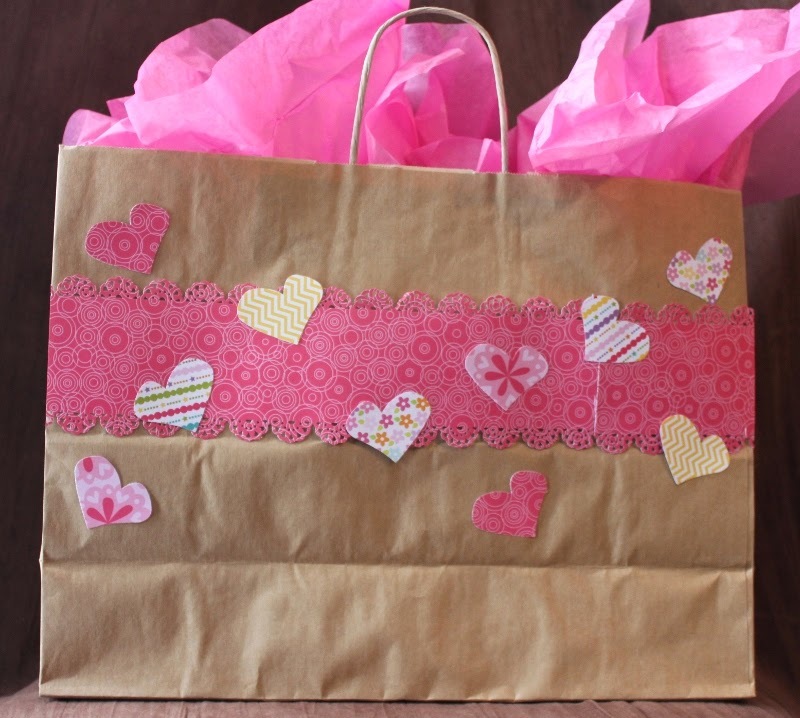 The gift bag itself is super easy, just grab a kraft bag and some patterned paper. Cut a wide border strip from 12 x 12 paper, cut two if your bag is as long as mine was. Then border punch the edges, I used an EK Success border punch. Then align the two strips to fit across the bag as shown and attach with adhesive. 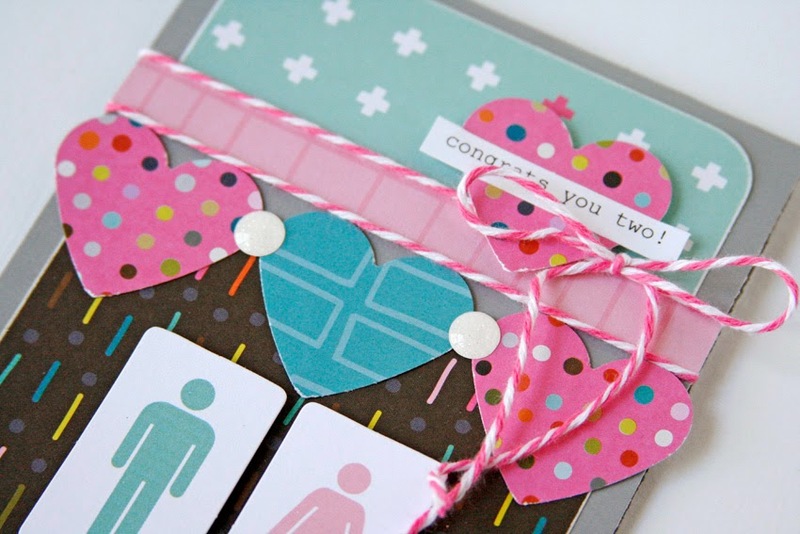 Then using a Fiskars Heart punch I added nine coordinating patterned paper hearts and attached them with adhesive. That was all there was to the bag, just finish with some coordinating tissue paper. 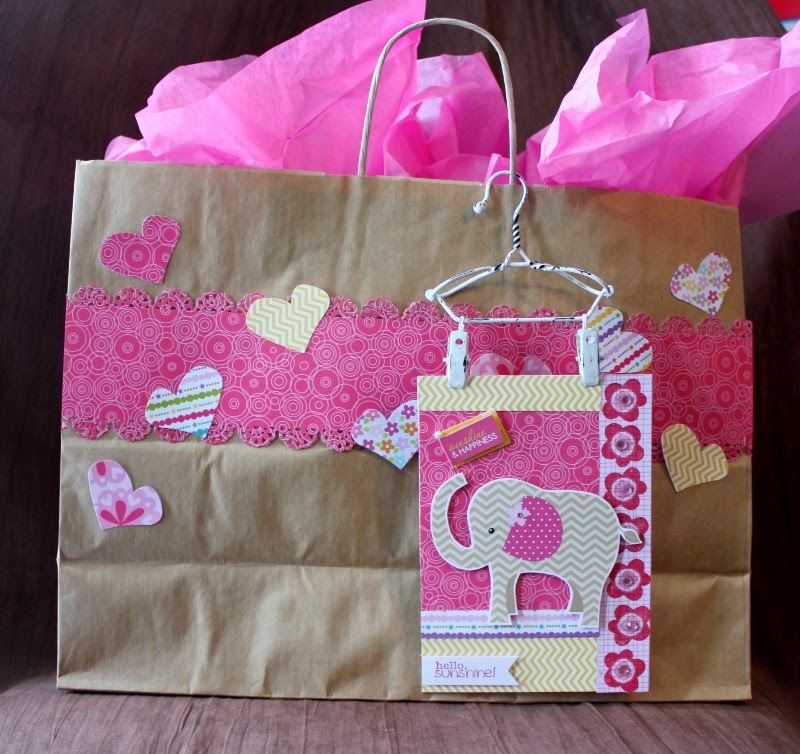 The Card is attached to the gift bag using a decorative shabby chic hanger. The card itself was made from two different Bella Blvd paper collections: Baby Girl Cutouts and Birthday Girl papers. The elephant was fussy cut from the cutouts page and set aside. Then I stamped the sentiment using Bella Boulevard Sand & Surf stamp set in pink ink onto white cardstock and cut banner tips. Next I stamped flowers in pink ink onto light pink pattern paper on border strip for right side of card. A chevron strip was added to top of card and a wider chevron strip was attached to the bottom left of card. Then a stripe border was added on top of bottom chevron strip as shown. The darker pink rectangle of pattern paper completes the base of the card. 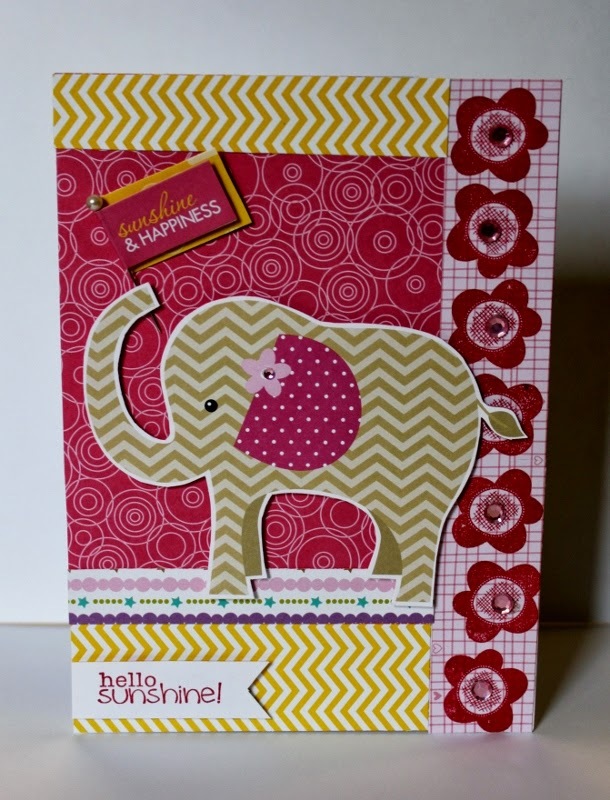 Next attach the elephant using 3D foam dots to the card front. Then add the Bella Blvd flag to elephant’s trunk as shown. Finally add the pink gemstones to flower centers to add some bling. There you have it, a baby shower set you can be proud to give! 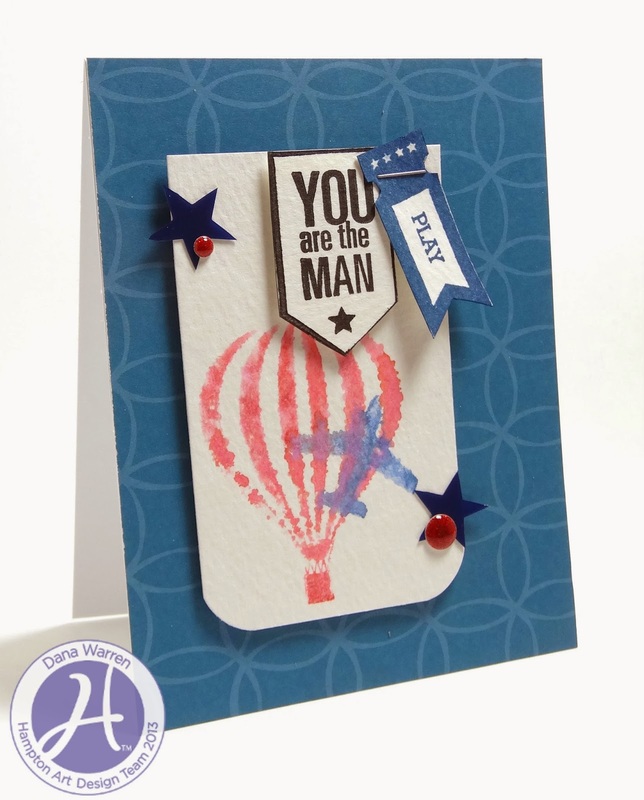 Today we have a video from designer, Dana Warren featuring how she created her card. Are you a retailer? Are you coming to the Collins Rep event/tradeshow at the end of the month in Massachusetts? We ARE! Come join us for 2 classes featuring the latest and greatest from Hampton Art and Jillibean Soup. The 1st class is features the new Stamps & Stencils from the Jillibean Soup brand. 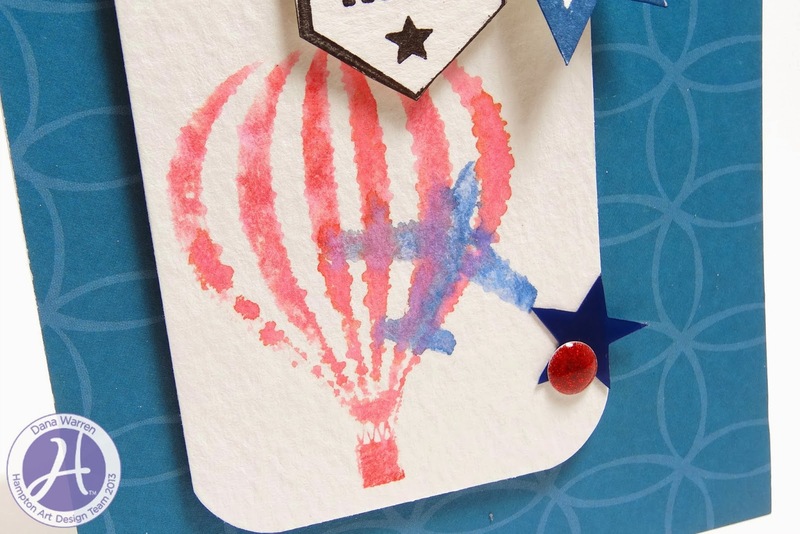 In this class we will use different mediums with the Stamps & Stencils to create 5 different tags. The 2nd class I'll be teaching is a layout and card class featuring the Jillibean Soup die-cut sheets aka Placemats. We hope to see you at this event and we are excited to share these great products with you! Hey Hampton Art fans! 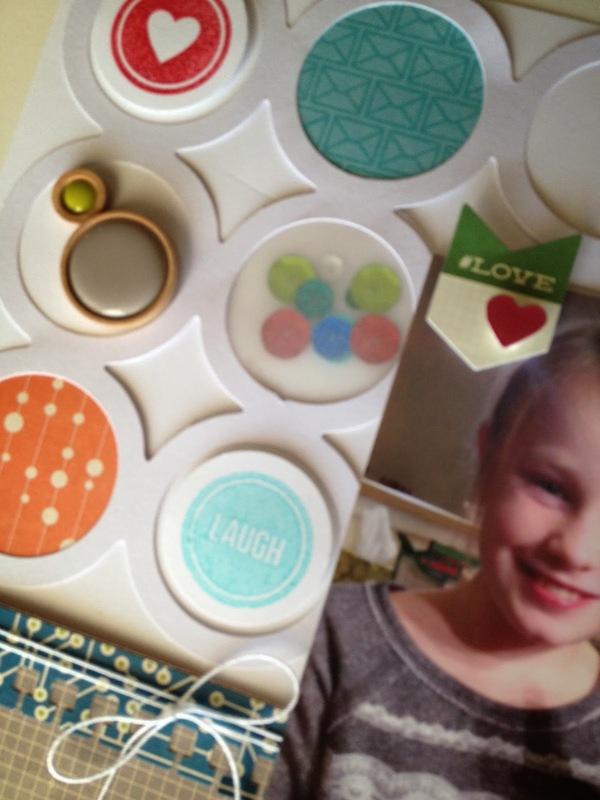 I am happy to be on the blog to share a fun page using the new KI Memories Playlist collection. 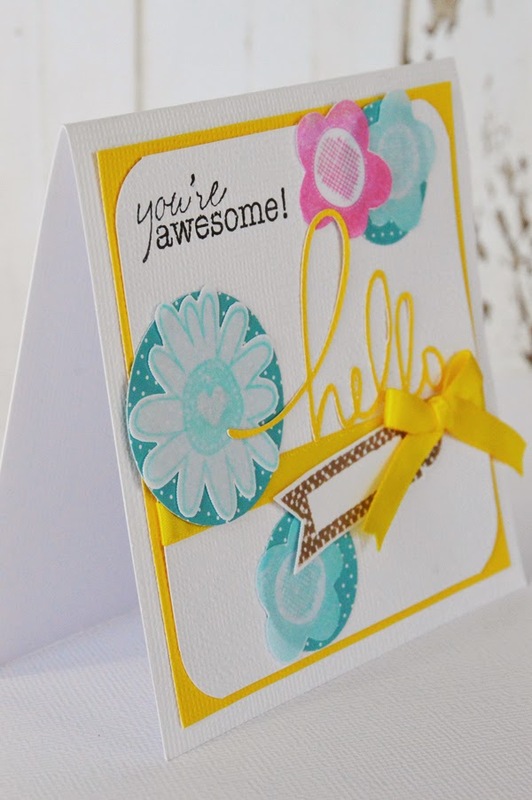 I love that this collection is double sided and you can very easily mix the A and B sides of the papers together! I did just that when filling in the circles on my project by first cutting circles out of cardstock and then adding some different sized strips to the back side of the cardstock. In addition to the new fun papers, one of my new favorite items are the Icicles. I love the fun acrylic embellishments. They add a fun dimension to the page!